In what I can only call an unqualified failure on my part, I missed this past Monday’s prominence as the anniversary of the birth of the late, great Groucho Marx. The comedian would have turned 127. If he were alive that milestone would certainly qualify him for membership he had no interest in being in simply because it would accept him. I came at the Marx Brothers catalog a bit sideways. My first exposure to their humor likely came from “M.A.S.H.”, on which Hawkeye Pierce (Alan Alda) would frequently don a fake mustache and oversized cigar and engage in a blatant impersonation of Groucho’s style, from the walk to the delivery and more. That got me interested in who this was he was aping, which led me to discover the films the Brothers had produced, first for Paramount and then for MGM. 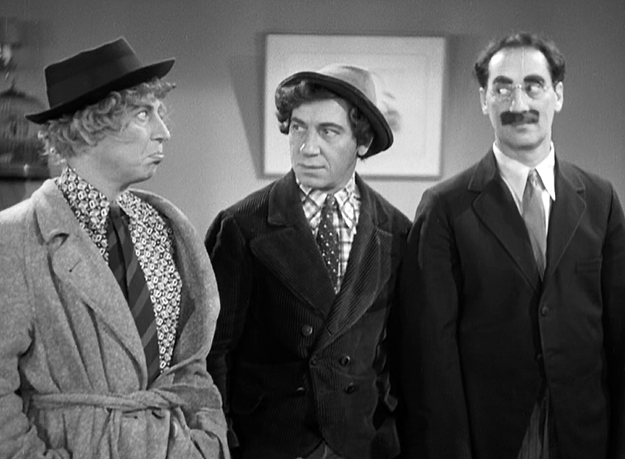 Because I can’t let such an auspicious milestone pass unremarked upon, especially when it comes to one of my comedic heroes, today we’re going to look back at the trailers for five of my favorite big-screen romps featuring Groucho and the rest of the Marx Brothers. Groucho plays Capt. Jeffery T. Spaulding, a famous explorer returning from an expedition to Africa and being welcomed back by Mrs. Rittenhouse (frequent Groucho foil Margaret Dumont) at her lavish estate. They become involved in a plot hatched by Arabella, Mrs. Rittenhouse’s daughter, to prop up the flailing painting career of her fiancé John, something that devolves into first-rate farce as mistaken identities, multiple forgeries of a famous painting and more all come crashing together. There’s remarkably little story contained in the trailer, other than a brief shot of Spaulding being carried into reception by a group of “natives.” Instead most of the running time is devoted to spotlighting the talents of each of the Brothers, from Chico’s piano playing to Harpo’s talent with the harp and more. There’s a bit of Groucho’s verbal fireworks but even that is in short supply, as the studio clearly felt it was just the combination of the four that was enough to draw in audiences. Hands down my favorite in their filmography and widely considered one of the greatest comedies of all time, Duck Soup is the pinnacle of everything the Marx Brothers had built in the preceding years. 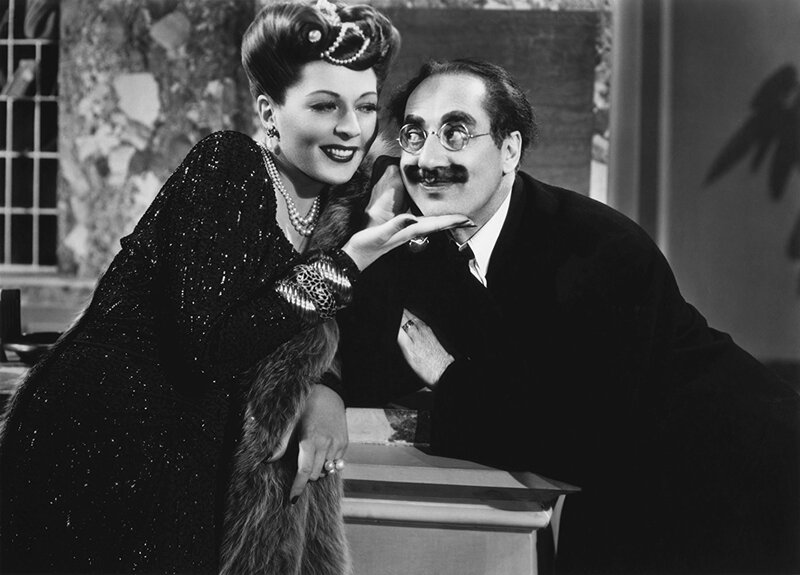 Groucho is Rufus T. Firefly, an unqualified huckster thrust into the leadership of Freedonia because he’s favored by the wealthy Mrs. Teasdale (Dumont). Aided by his secretary (Zeppo) but undermined by two agents of neighboring Sylvania (Chico and Harpo), Firefly’s ego winds up getting in the way of peace between the two countries more than any plots of sabotage. None of that is on display in the trailer. Instead, it’s sold as just the latest exercise in insanity featuring the four brothers, with almost no explanation given as to what situation they find themselves in this time. There are scenes of pomp and circumstance, but it’s mostly selling the promise of more pratfalls, verbal jousting, and musical numbers. Zeppo exited the familiar team when they switched studios, arriving at MGM and experiencing a change in tone. Gone were the gleeful anarchists of the Paramount years, replaced by a bunch of eccentric but generally nice characters, eager to help the girl wind up with the right guy and for someone who needed their aid to get it. All these elements were on display in A Night At the Opera, which is no less funny for the change in tone. The Brothers introduced themselves as the trailer opens as each one appears in the place of the lion in MGM’s famous opening, heralding their arrival at a new home. 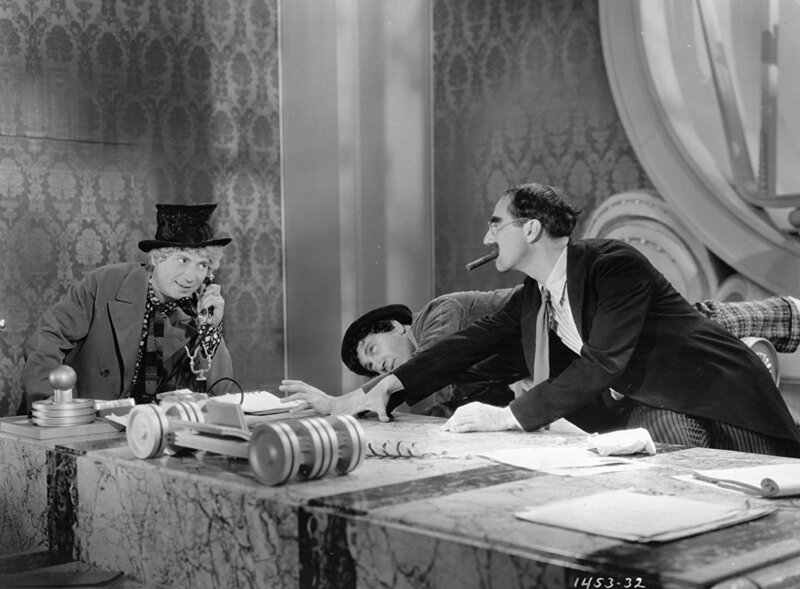 Despite the more helpful approach of their character in the story, the trailer still sells the movie as being filled with the raucous antics audiences had come to expect, with little story laid out but plenty of Groucho’s famous rejoinders and attempts to get out of ever paying a check. The troupe was firmly entrenched at MGM by the time of 1938’s Room Service, the only one of their films not either based on an existing stage play or written specifically for them. 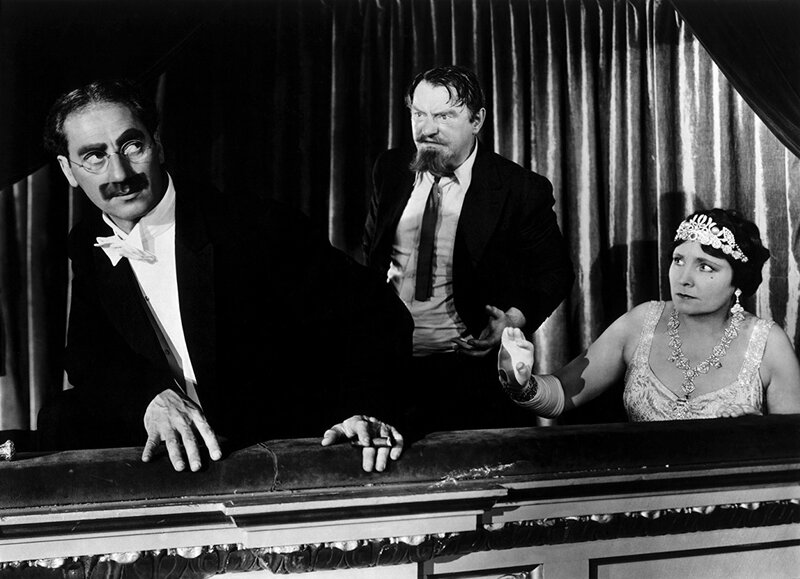 Groucho is Gordon Miller, who’s producing a play while trying to house his cast at a hotel he has no plan to pay. Much of the plot involves finding someone else to foot the bill, namely a mysterious backer, before everyone is evicted by the hotel manager. The trailer opens immediately with lots of things falling on various people, showing we’re in physical comedy territory here. Co-star Lucille Ball shows up as the would-be star of the play. From there on out it’s slamming doors and propped up bodies and more, selling audiences on a zany farce. There’s also a notable focus here on the supporting cast, which included Ball and other studio system-era character actors, something that was relatively unusual in the marketing of the Marx Brothers’ theatrical outings and reflecting, perhaps, changing audience tastes. This isn’t the final Marx Brothers feature – that would come three years later in Love Happy, but is essentially the end of the group as a box-office powerhouse. Groucho plays Ronald Kornblow, the manager of a hotel in Casablanca that stands between a criminal and the stolen art he’s trying to retrieve. He’s variously aided and hindered by the involvement of Corbaccio and Rusty (Chico and Harpo). Madness. mayhem and mirth are all promised as the trailer opens. It goes on to sell the movie as a direct spoof of the Humphrey Bogart classic Casablanca. There’s no footage here, just a series of production stills with narration that lays out the story and promises the Brothers will be getting into all their usual hijinks. That comparison to the *other* Casablanca was a point of contention that verged on, but never resulted in, legal action, a point the Brothers were all too happy to use to help raise the movie’s profile. That makes the movie’s eventual acquisition by Warner Bros., the other party in the potential legal action, fairly hilarious. Groucho was well-known as a fast-talker, delivering insults and jabs and moving on so quickly he was five deep before the person he was insulting knew what hit him. Each one of the Marx Brothers brought something unique and essential to the ensemble, but Groucho remains my favorite because his comedy was about words and the power they have. He talked himself both into and out of situations, always staying one step ahead of bill collectors and other bullies, both selfish and protective.